At the top of the Curiosity rover's to-do list next year is the first use of its rock-boring drill, allowing scientists to examine samples from inside Martian rocks with the robot's instrument suite. The drill is designed to hammer into rocks and collect material for analysis by the rover's chemical and mineral sensors. For the drill's first use, the Curiosity team is looking for a rock in a shallow pit named Yellowknife Bay. Curiosity entered Yellowknife Bay in mid-December. Yellowknife Bay, which is about a half-meter deep, lies in a different type of terrain than the area visited by Curiosity since its Aug. 6 landing. "The team is now searching in earnest for a suitable rock for our first drill activity after the holidays," said Colette Lohr, tactical uplink lead for the Curiosity rover mission. Curiosity is the first Mars mission to carry a drill to explore the inside of rocks. The percussive drill is part of a package of tools at the end of the rover's robotic arm, and it's the last of Curiosity's instruments to be used since landing. The drill will extract powder-like material from the interior of rocks, and the samples can be deposited into instruments inside the rover. "This has been a really exciting time for the team because we've started to do what we call discovery-driven planning, and this is when we, in a sense, hand the rover keys to the science team," Lohr said in a video update posted this week. With most of Curiosity's systems vetted and operational, control over the rover's daily operations is transitioning from the mission's engineers to the science team, according to Lohr. 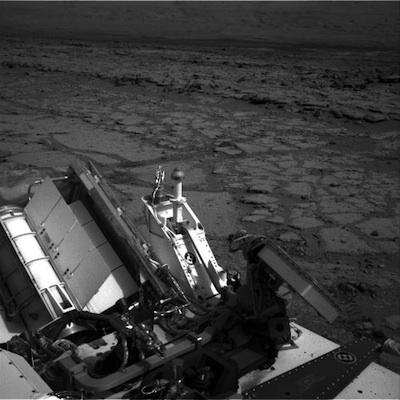 Curiosity spent the week of Christmas at a location dubbed "Grandma's House," where the rover was programmed to acquire imagery for a 360-degree panorama of its surroundings at Yellowknife Bay. Scientists will use the images to look for the first drill target. The rover has already collected soil samples with a scoop and used a laser to burn away the top layers of rocks to measure their composition. Curiosity has driven about 2,000 feet since its arrival on Mars in August, and the rover is now in a region named Glenelg, where three different types of Martian terrain meet. Once the rover finishes its work at Glenelg early next year, drivers to guide Curiosity toward Mount Sharp, the mission's primary objective. Mount Sharp is a three-mile-high peak in Gale Crater, the ancient impact site where Curiosity landed. Observations from satellites orbiting Mars show Mount Sharp's foothills could contain clays, which harken to a time when the planet was warmer and wetter.